I went and got a new bike yesterday! It's PIIINNNKKKK!!!! 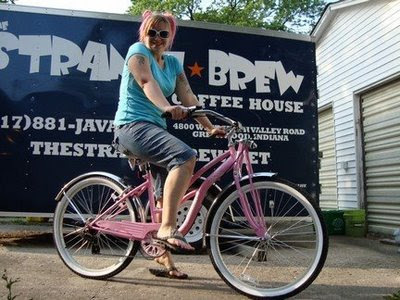 It's a 7-speed cruiser, the seat is pink and white, it has super cute fenders on it... I'm in love! Dan even took it for a spin! 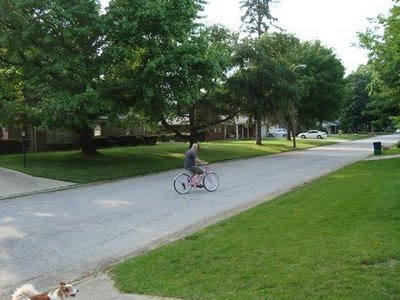 I realized one thing about not being on a bike since 2000 though... I forgot how to ride! My first few minutes on it were VERY wobbly, but I got the hang of it after a couple laps around the block. Thought our driveway (hill) was still giving me issues by the time I quit riding. And I am too scared to attempt to bike down the hill! I'm looking forward to riding though, and I'm hoping that Dan will find a bike that he likes soon so we can ride together. I'm hoping that we'll be able to bike to work on the weekends and save a teeny bit of gas $$! Make sure that regardless of what Dan gets, you put tassels on it! Shimmery ones. Love the bike. I haven't been on one since the kids were young. More years then I'd care to remember. If we had paved roads I just might give it try. Where did you find that style?